The IZULA II is the same as the IZULA except that the handle is 1/2″ longer & it comes with canvas Micarta handle scales. This unique knife is extremely handy and will fit in most anywhere. Whether you carry it in a belt sheath or as a neck knife, the Izula will not disappoint you with its performance. 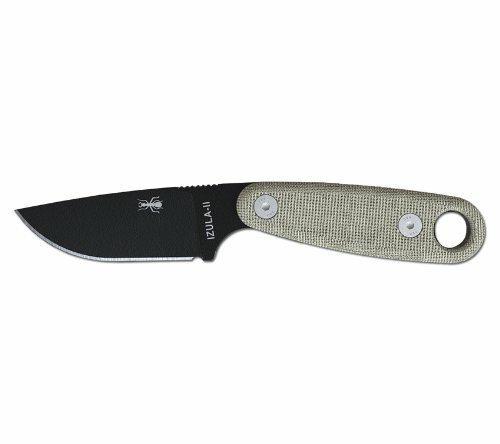 Where did the name IZULA come from? The locals in Peru call the meanest, nastiest ant of the jungle by the name “Isula” (spelled with an “s”). We know it as the Bullet Ant. The Bullet Ant is known to be independent, tough, light on its feet, and a real aggressive survivor… the IZULA knife is built the same way. This knife is designed to be the perfect lightweight survival kit or concealed carry knife. Features a high quality, wear resistant textured powder coat finish, pommel hole to accommodate carabiner, thumb grippers on the spine and each knife engraved with name, logo and unique serial number. Includes: black Izula II with Canvas Micarta handles & black molded sheath.